Fry's destiny is a recurring story arc in Futurama. In all simplicity, Philip J. Fry is a "Mighty One", the only person on Earth who can help the Nibblonians save the entire universe from the evil Brain Spawn, and they therefore choose to freeze him in the year 1999, so that he can be alive and help when needed in the future. The Nibblonians choose to freeze Fry in the year 1999, so he can be alive in the year 3002. For millennia, the Nibblonians have been at war with the Brain Spawn, a race of sentient brains bent on destroying all thought in the universe. In order to defeat the Brain Spawn, the Nibblonians required the help of the fabled "Mighty One" who was immune to the Brain Spawn's attacks. By 1999, the Nibblonians had learnt that Philip J. Fry was the Mighty One. In addition to that, they foresaw the completion of the Brain Spawn's Infosphere, and knew that only Fry, due to his lack of the delta brainwave, was the only one who could save existence from the fearsome Aliens. Unfortunately, that event was to occur sometime in 3002, and Philip J. Fry could not live that long. To save the universe, the Nibblonians decided to cryogenically freeze Fry. They sent Lord Nibbler to Earth, who arranged for Fry to be at Applied Cryogenics at the turn of the millennium. Seconds into the year 2000, Nibbler caused Fry to fall into a cryo-tube, freezing him for one thousand years. Fry's ability to stop the Brain Spawn was put to the test in the year 3002. The Brain Spawn had been heading towards Earth, destroying several planets along the way. Upon hearing of these planets' destruction, Nibbler fled to Planet Eternium, taking Turanga Leela with him. There, Leela learned that Fry was the only one capable of defeating the Brain Spawn and was charged with delivering a message to him, explaining what he needed to do. Back on Earth, Leela managed to tell Fry about the Brain Spawn, going with him to the New New York Public Library to confront the Big Brain. After Fry tricked the Big Brain into leaving, the Nibblonians rushed in consume the remaining Brain Spawn on the planet. After the confrontation, Nibbler sent a transmission to Planet Eternium, revealing that life on Earth had returned to normal, but foreshadowed another confrontation with the Brain Spawn. Fry pushing himself into the cryo-tube "The Why of Fry". Nibbler's fears were realized two years later. The Brain Spawn neared the completion of their giant memory bank, the Infosphere. Once they finished it, they intended to destroy the universe. Nibbler abducted Fry and took him to Planet Eternium, where Nibbler, along with Fiona and Ken, explained to Fry how to destroy the memory bank. Fry managed to infiltrate the memory bank, but was discovered after letting his curiosity get the better of him and attempting to learn the answers to the greatest questions of all time. Fry, trapped, activated a quantum interphase bomb. 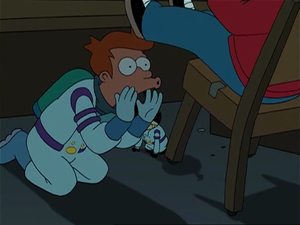 Before being sucked into the alternate universe, Fry used his final seconds in his home universe to find out that Nibbler was the one who made him fall into the cryo-tube. The bomb activated, which sucked Fry and the Brain Spawn into an alternate universe. Trapped in the alternate universe, Fry lamented being tricked by the Nibblonians. The Big Brain revealed that Fry could take advantage of a nexus point and return to the year 1999, and stop Nibbler from freezing him. Fry took advantage of this, appearing in time to stop Nibbler from causing his past self to be frozen. After a quick argument, Nibbler offered Fry a choice, to live in the past or remain in the future with his friends, specifically Leela. Fry chose the future and caused his past self to fall into the cryo-tube. Before being returned to the alternate universe, Fry gave Nibbler a warning which allowed Fry to escape the Infosphere before its destruction. In 3009, a group of mind readers called the Legion of Mad Fellows needed Fry to help them save the Universe. Fry first found after he had been temporally been given the power to read minds himself. Nine, realizing that while Fry could read minds, his mind can not be read. The Legion asked Fry to help protect the violet dwarf star from the Dark Ones, who like the Brain Spawn, also attack using the delta brain wave. This page was last edited on 28 July 2013, at 22:32.